A notebook found at Kerning Tower's third floor Arts & Entertainment Shops. Attacks by opening up and slamming into the ground. A monster from Temple of Time, found at Road of Regrets 1. It casts a magic attack by concentrating magic into a sphere and releasing it. A black squishy slime that always carries a Red inner tube around with it. This one is weak to ice. Found in Singapore's Boat Quay Town. A fish-like creature found along the canals of the Commerci Republic. Attacks by shooting an arrow at you. A stronger version of Sureshot Delfino, found in the barrier deep within the canals of Commerci Republic. A pair of headphones found at Kerning Tower's fourth floor Music Shops. Attacks by firing a music note-shaped ball at you. A praying mantis monster found near Stone Colossus's Exploration Site. It can attack by clashing its front legs together. A black squishy slime that always carries a blue inner tube around with it. This one is weak to Fire. Found in Singapore's Boat Quay Town. A fish-like creature found along the canals of the Commerci Republic. Attacks by firing a magic orb out of its staff. A stronger version of Voodoo Delfino, found in the barrier deep within the canals of Commerci Republic. A dragon skeleton found at the end of Leafre's Dragon Nest area. When provoked, it can raise the Weapon Attack of all other monsters around it. It can fire a short-ranged laser beam out of its mouth. The Star Force version of Skelosaurus. Found at Leafre's Dragon Nest area, in a series of maps that require 65 and 70 Star Force. A monster from Temple of Time, found at Road of Regrets 2. It casts a magic attack by concentrating magic into a sphere and releasing it. It can also cast a ice-based spell, which is unavoidable. The helpers also attack by scratching you. A black squishy slime with an octopus on its head. Found in Singapore's Boat Quay Town. The octopus attacks by spitting ink at you. A makeup set found at Kerning Tower's fifth floor Cosmetics Shops. Attacks by chomping at you. A sailor ghost that always carries a fishing rod. Found in Singapore's Boat Quay Town. It attacks by swinging its broom at you. EXP: A praying mantis monster found near Stone Colossus's Exploration Site. It can attack by clashing its front legs together. A walking dressing table found at Kerning Tower's fifth floor Cosmetics Shops. Attacks by slamming its front drawers into you. A hair roller found at Kerning Tower's sixth floor Hair Salons. Attacks by rolling fast to create friction. A perm machine found at Kerning Tower's sixth floor Hair Salons. Attacks by breathing fire at you. The Star Force version of Enraged Espresso Machine. Found at the end of Kerning Tower's second floor cafe, in a map that requires 80 Star Force. A monster from Temple of Time, found at Road of Regrets 3. It can attack with its fists, and can slam a spear into the ground, which is indicated by an area warning on the ground. A sailor ghost that always carries a broom. Found in Singapore's Boat Quay Town. It attacks by pushing its mop at you and sweeping the ground. A flower monster found near Stone Colossus's Exploration Site. It can attack by creating flames with its "hands" and hitting you with them. The boss of Kerning Tower, who must be defeated at the end of the questline. Also found in a special map after you complete the Kerning Tower questline, accessed by clicking the guitar in the Penthouse (KMS only). The boss of the Delfinos. Attacks by blowing water at you, casting two types of magic with its spear. Involved in a quest. The boss of the Delfinos. Found at Canal 6. An immobile sphere of time. It is summoned at the Origin of Clocktower using the Piece of Cracked Dimension. 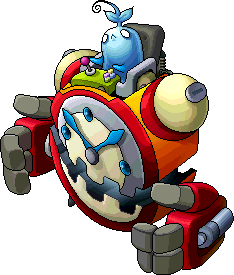 After 6 seconds, it will then disappear and summon Papulatus Clock in Normal mode. The final boss of Ludibrium, in Normal mode. For more information on the boss battle, visit this page. The final boss of Ludibrium in Normal mode. Papulatus is separated from its ride, but has a few more tricks up his sleeve! For more information on the boss battle, visit this page. A clone summoned by Papulatus, in Chaos mode. These can fire a projectile just like the real Papulatus, but is much weaker. 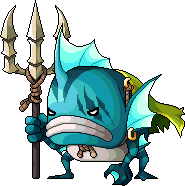 Kill these quickly, because Papulatus has he ability to consume these and absorb 20% of his HP per clone in Chaos mode! 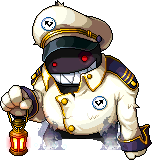 A sailor ghost that always carries a rope. Found in Singapore's Boat Quay Town. It attacks by whipping you with its rope. The Star Force version of Blue Notebook. Found at the end of Kerning Tower's third floor Arts & Entertainment Shops, in a map that requires 80 Star Force. A monster from Temple of Time, found at Road of Regrets 4 and 5. It can attack with its fists, like the regular Qualm Guardian, and it can punch the ground with great force. It can also launch a long-ranged spear projectile at you. A sailor ghost that always carries an anchor. Found in Singapore's Ghost Ship. It attacks by swinging its anchor at you. A wolf monster found at the entrance to the Suspicious Forest in Commerci. Attacks by scratching you. A hornet monster found in the Swarm Habitat of Stone Colossus. Attacks with its stinger. A hornet monster found in the Swarm Stronghold, a special map of Stone Colossus. Attacks with its stinger. A wolf monster found at the Suspetto Forest Trail in Commerci. Attacks by charging into you. A hornet monster found in the Swarm Stronghold, a special map, of Stone Colossus. Attacks with its stinger. The Star Force version of Red Headphones. Found at the end of Kerning Tower's fourth floor Music Shops, in a map that requires 80 Star Force. A large boss from Temple of Time, found at Road of Regrets 5. 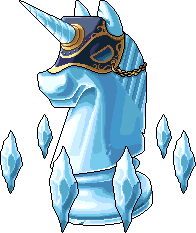 It looks a lot like the classic chess piece, Knight. When it elevates, it will pound the ground to knock you back. The ice shards around it are launched into the air then come back down to hit you as a form of attack. It is weak to lightning. Lilynouch also casts damage reflect (To magicians, this is lethal since Damage Reflect damage bypasses Magic Guard). The corrupted version of Lilynouch, which must be killed for the Silent Crusade. It has the same abilities as the real Lilynouch. A monster from Temple of Time, found at Road to Oblivion 1. 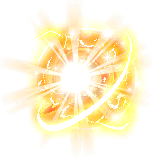 It casts an avoidable magic attack by concentrating magic into a sphere and releasing it. The Star Force version of Eye of Time. Found at the Detour to Oblivion area in Temple of Time, a series of maps that require 90 Star Force. The Star Force version of Oblivion Monk. Found at Detour to Oblivion 1 in Temple of Time, a map that requires 90 Star Force. A tree spirit monster found on the Stone Colossus's Torso. It attacks by stomping the ground. Resembles Guwaru in a way. An elegant fox with a cloud as a tail. Found at the Deserted House near Mushroom Shrine. A dark version of Field Fox. Found at the Deserted House near Mushroom Shrine. These annoying birds are found flying around in good numbers at the Village Entrance near Mushroom Shrine. These birds are found flying around in good numbers at the Vanished Village near Mushroom Shrine. Oddly named Black Crow, even though it's blue. A small flying monster that resembles Jr. Wraith. Found at the entrance to the graveyard and at the Hunting Lodge near Mushroom Shrine. A black snake that has replaced the spawn of Bains in Zipangu. Found at Showa's Armory. A black slime creature from Singapore's Ulu City. It seems to be strong, ripping trees out of the ground roots and all. 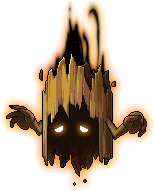 It attacks by swinging the tree at you, which can stun. An assassin found in the Sospetto Forest of Commerci Republic. Attacks with its knives. A stronger version of Nightcutter Assassin, found in the barrier deep within the Sospetto Forest of Commerci Republic. A pirate that appears during the Commerci Republic quest line, while helping Leon Daniella fight them off. The captain of the pirates in Commerci Republic. He can use his guns to attack you. Tengu is the newest boss of Mushroom Shrine, and is related to the Mushroom Shrine Tales content. Tengu faces you as a last challenge before he helps you save Takeno Kinoko, the sister of Kino Konoko, to test if you are truly worthy of possessing the Wood Element he carries that is required to save her. Tengu, unlike most bosses, cannot be defeated by attacking him directly. Instead, you must rely on special quick time events to defeat him; after specific attacks where he lands on the ground, a purple zone will appear, prompting you to start pressing keys in a certain order (with S representing the Spacebar). Doing this will take out a fraction of Tengu's HP. After you complete the Mushroom Shrine Tales questline, you can fight him again to raise your closeness for the Mushroom Shrine character of your choosing. This boss is located at the end of the Ghost Ship found in Boat Quay Town, an area of Singapore. It can summon 4 Selkie Jr. and 2 Mr. Anchor. It also can heal once its HP falls below 80%. It does very large damage with its Magic attacks. He appears to be behind the events surrounding the boss Krexel, due to the fact that he sealed a portal in the Ruins of Krexel. This is the first preliminary boss before you fight the real Horned Tail. This Head is Ice Based and will use many Ice skills. 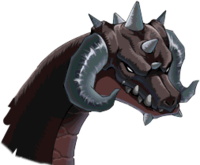 It can also summon Wyverns, and can cause a new Status Aliment called "Seduce" which can be countered with the use of Heros Will or having the leader of the group hang onto the rope within the room so it cannot move while Seduce is in effect. Can also make itself immune to Physical/Magical attacks for a short time like Zakum. This is the 2nd preliminary boss before you fight the real Horned Tail. This head is Lightning Based and will use many Lightning based attacks with the same effects of the last preliminary head. It can also summon Wyverns and cause Seduce. Can also make itself immune to Physical/Magical attacks for a short time like Zakum. This is the Left Huge Head of HornTail, in a smaller, more compact form to fit inside the room. It has the same abilities as the Huge Head, minus being able to Seduce. 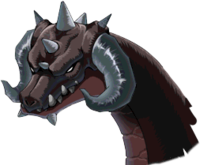 The strongest of Horntail's heads. This head is Fire element. It also has the ability to be resistant to Magic or Physical attacks. 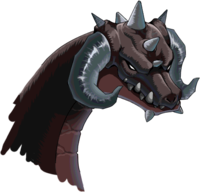 This is the Right Huge Head of HornTail,in a smaller, more compact form to fit inside the room. It has the same abilities as the Huge Head, minus being able to Seduce. This part of Horned Tail has the ability to drain 3,000 mana every time it attacks. It also increases the Weapon Attack of the entire Body and has the very annoying Seduce Ability. This part of Horned Tail has the ability to drain 3,000 mana every time it attacks. It also increases the Magic Attack of the entire Body and has the very annoying Seduce Ability. It can also cause your abilities to be sealed and can cause Darkness. This part of Horned Tail can heal HP and MP for all parts of the Body. Its additional abilities are, it can summon 2 Green Cornian and Dark Cornian, and it has the ability to raise the weapon defense and magic defense of the entire body. It has a stomp attack which knocks you back to the wall, and another Stomp ability which can cause 2 second stun. It has an earthquake attack. It lifts up its tail and slams it into the ground. You must jump to avoid it. It also has a poison mist attack which is created by farting. Suggested to take this out with the legs since its just as deadly as the legs. This is the first preliminary boss before you fight the real Horned Tail. This Head is Ice Based and will use many Ice skills. It can also summon Wyverns, and can cause Seduce, which causes you to walk left, right, or jump without being able to control yourself or use potions, and can be countered with the use of Hero's Will. Can also make itself immune to Physical/Magical attacks for a short time like Zakum. This is the Left Huge Head of HornTail, in a smaller, more compact form to fit inside the room. It has the same abilities as the Huge Head. The strongest of Horntail's heads. This head is Fire element based. It also has the ability to be resistant to Magic or Physical attacks. 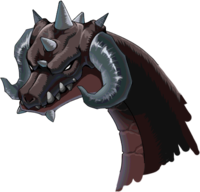 This is the Right Huge Head of HornTail,in a smaller, more compact form to fit inside the room. It has the same abilities as the Huge Head. This part of Horned Tail can heal HP and MP for all parts of the Body. Its additional abilities are, it can summon 2 Cornian and Dark Cornian, and it has the ability to raise the weapon defense and magic defense of the entire body. It has a stomp attack which knocks you back to the wall, and another Stomp ability which can cause 2 second stun. The Knockback stomp attack is completely unavoidable. Suggested to take this out first since it can one hit many Night Lords/Bowmasters/Marksmen relatively easy, so pit all Heroes and Paladins against this part at the left side. It has an earthquake attack. It lifts up its tail and slams it into the ground. You must jump to avoid it. It also has a poison mist attack which is created by farting. Suggested to take this out with the legs since it's just as deadly as the legs. This page was last edited on 3 March 2018, at 20:22.